(Picasso) meets some rich and careless Americans and gradually, being no dummy, perceives among the cultural elite with whom he is hanging out, and perilously hanging on, a phase-shift in their parameters of self-definition. These folks are no longer building gazebos and placing symboliste Madonnas in fern-choked grottos. They are running with the bulls—something Picasso can understand.. . . so Pablo Picasso—neither the first nor the last artist whom rapacious careerism will endow with acute cultural sensitivity—goes for the throat, encapsulates an age with a painting of French whores, and through no fault of his own, creates the cornerstone of the first great therapeutic institution. 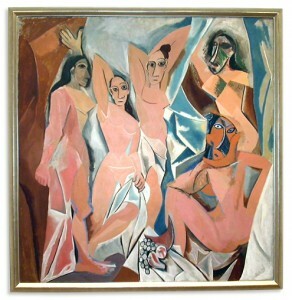 I have no wish to diminish Picasso’s achievement by this insouciant characterization of it, but I do want to emphasize the fact that, during the period in which Demoiselles was painted, pictures were made primarily for people, not against them—and to suggest further that if we examine the multiplication of styles from 1850 to 1920, we will find, for each of them, a coterie of beholders, an audience already in place. In other words, Picasso’s creative breakthrough and all of the other breakthroughs of modernism in that period were market-driven. This is anathema to those who see art as an oppositional force, a way of pushing back against the control of minds and emotions by economic and social forces that govern our likes and dislikes—in other words, what became the typical postmodern critical agenda in the second half of the 20th century. The outcome of this pernicious development–pernicious, from Hickey’s perspective–is the production of art that shocks and offends nearly everyone, in the name of therapy, under the rubric of no pain, no gain, in spiritual terms. He loathes this outlook, and the way it has given the academy and various institutions power over popular taste and judgment. We know better than you do what’s good for you, so look at it and learn to like it! That’s the implicit creed behind so much of what disgusts him in art. It’s the question that Henry and Lenka were batting back and forth in my last post: should art be created for the sake of money? Should artists think about the market when they decide how to create their work? In other words, should art attempt to please a viewer in some way, charm the viewer, draw her into the work–and then deliver whatever “content” it must–instead of being a shock to the system, a wake-up call full of insolent friction. The irony of that conversation outside The Pride of Spitalfields is that neither of these artists are thinking of the market when they make their excellent, and little-known, work. They are being completely true to themselves. And yet Henry was taking Hickey’s side—the market is hugely important in the production of art, and should be, and art that reflects this may be exactly the kind of art we want. According to Hickey, that’s exactly what Picasso thought. But I sympathize with Lenka as well: Van Gogh was ahead of his market, sadly, and so it was right that he painted against the taste and understanding that surrounded him.